Lomography’s launch of the Diana F+ in 2007 wasn’t a step forward in lo-fi photography. It represented a hommage to the medium format camera that would lead to the development of that movement – the original Diana camera and its numerous clones. So how does one of these stack up to the 21st century. Made by The Great Wall Plastic Company in Kowloon, Hong Kong, the original Diana Camera was mainly sold for export. Some describe production beginning when the company open it’s factory in 1955 , others say the early 1960’s. The original Diana was followed by a legion of clones. These were made by both Great Wall and many rival companies with the bulk ending up in the US & UK. Sold incredibly cheaply for just $0.25 a camera wholesale by US distributors, they retailed as low as $1. 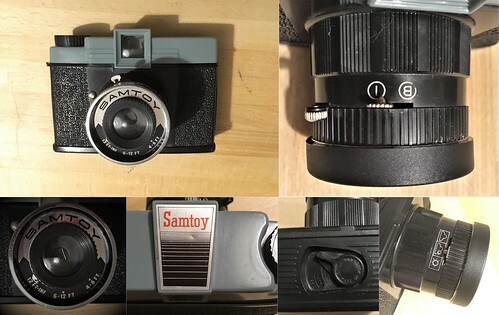 Many ended up as cheap fairground prizes or promotional items like the Reader’s Digest Camera.This South China Morning Post article details much of this especially the fact the SIno-Flex clone was boxed with a picture of the now conductor Sir Simon Rattle as a baby on the side ! Photographer Allan Detrich collected over200 variants and clones in what is now called the Detrich collection which is now owned by Lomography. Product ceased in the 1970’s due to the rise of 35mm cheap Trashcams flooding the low end market. These included the likes of a color optical lens cameras including the eponymous Time camera and its clones like the Barclaycard. And that would have been that but the Diana started to become of interest in the arts world. It was the valued for its unique images and lack of technology. Wikipedia notes the San Francisco Arts school started using it in its undergraduate program in the late 60’s. The Diana was perhaps most pushed in the arts community by Nancy Rexroth. By this time the Diana was out of production and the Lo-Fi community had to make do. The Holga carried on the torch from the 1980’s. In 2007 Lomography brought the Diana back with the Diana+ then the Diana F+. As far as i can tell like most clones my Samtoy is near identical to the classic Diana with the classic 2 tone blue/black plastic bod. The Diana bore an uncanny resemblance to the Agfa Isoly cameras. There seems to have been subtle variations within the clones usually on stylistic grounds but some do have different frame sizes, support 620 film or slightly different focal lengths. Camera-wiki has several models shown. The notable different model is the Diana F which allowed the use of AG-1 flash bulbs. The later still Diana De Luxe offered both a hot shoe flash mount and a bigger frame 6x6cm mask. 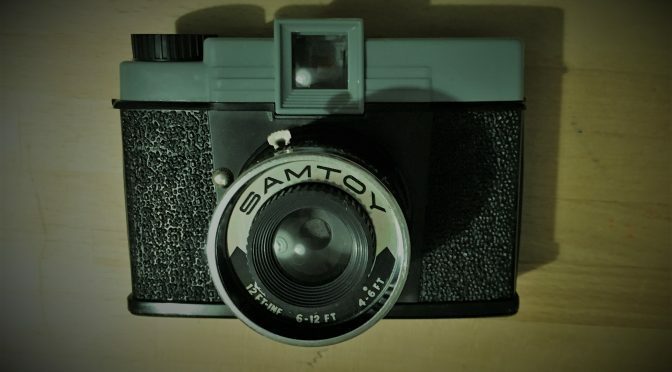 I’m careful here in describing my Samtoy as there does seem to be subtle differences between models and there is some debate between sources as to even the Original Diana which it closely resembles. The Diana manual has no info on specifications. This a cheap plastic affair made predominantly of plastic. Unlike the Color Optical lens cameras that would follow the plastic seems to have worn better. The simple plastic meniscus lens has 3 focus zone (4-6ft, 6-12ft and 12ft-infinity). You set the focus by rotating the inner ring around the lens. I can’t find any discussion on line about the focal length. 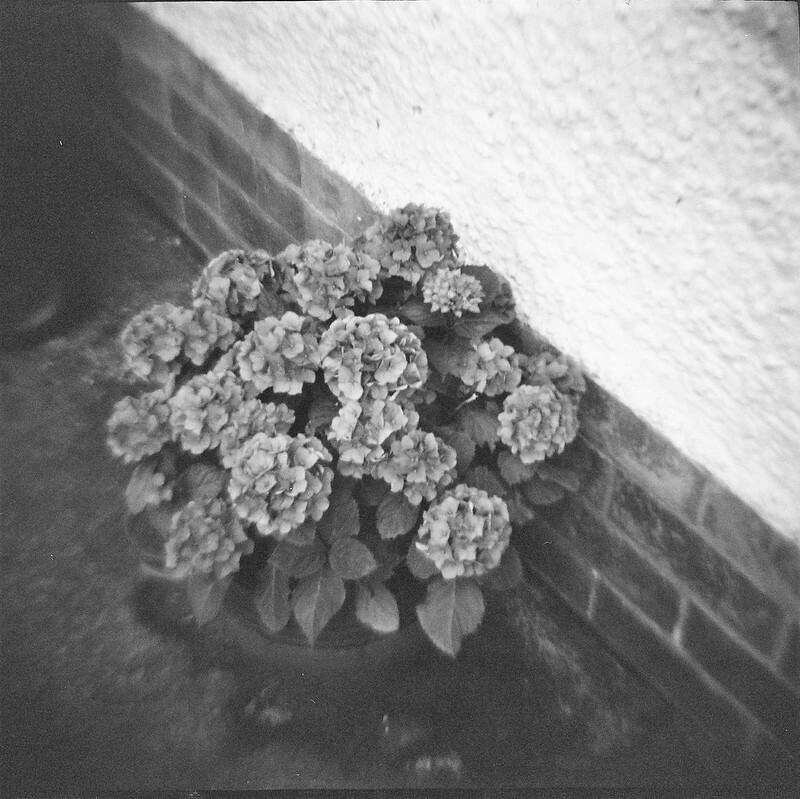 But I guess on rough eyeballing with my Diana F+, it’s around 70-75mm. Just as with the modern Diana F+ there are 2 switches to the back of the lens barrel to set shutter and aperture. The shutter in these cameras offer 2 setting one for a bulb setting and one for a so called Instant (i.e standard) setting. That setting is somewhere between 1/45 and 1/100. The everset type shutter doesn’t need cocking so intention or unintentional multiple exposures are easy. The aperture sets by moving a switch between 3 weather pictograms (sunny, overcast, cloudy). This switch moves in a set of 2 Waterhouse stops. However there’s some debate about the aperture size. Allan Detrich’s now web archived site has a discussion about various proposed setting but both me and Wikipedia are inclined to go with the (Sunny f/19, overcast f/13 and cloudy f/11). This is based on the widest aperture being around 0.6mm. 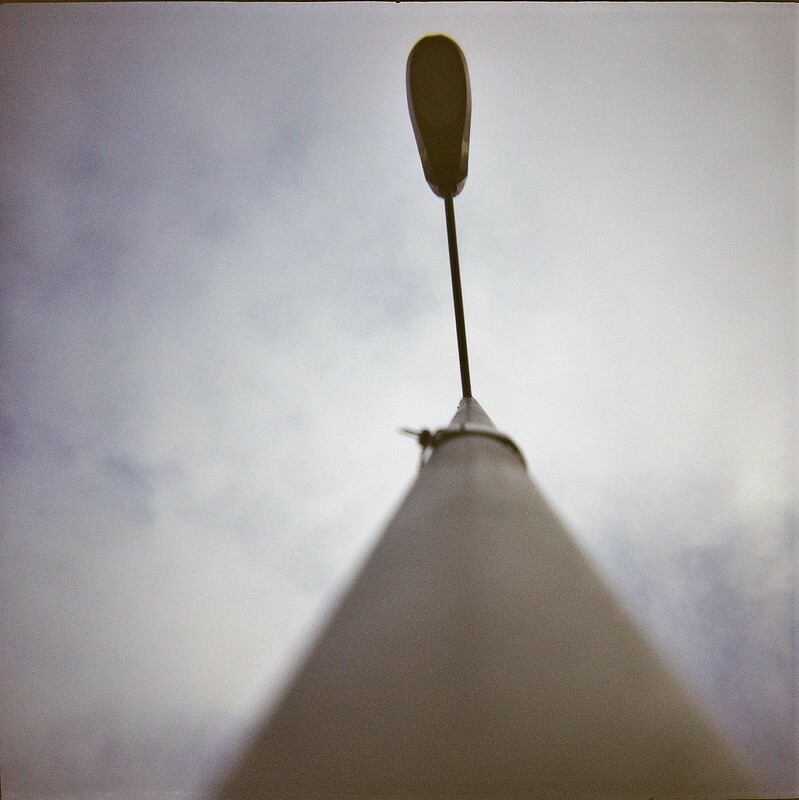 The camera overall is nigh on identical to using a modern Diana F+. Loading is easier as the Samtoy and the Diana have a hinged sprocket holders on the base. This is way better than the F+ fixed bit of plastic that tends to ping off. This as basic as cameras come. Unless your’re up to serious Lomo Hi-jinks you’ll not use the bulb setting. Like the F+ the viewfinder is pretty atrocious for centering. 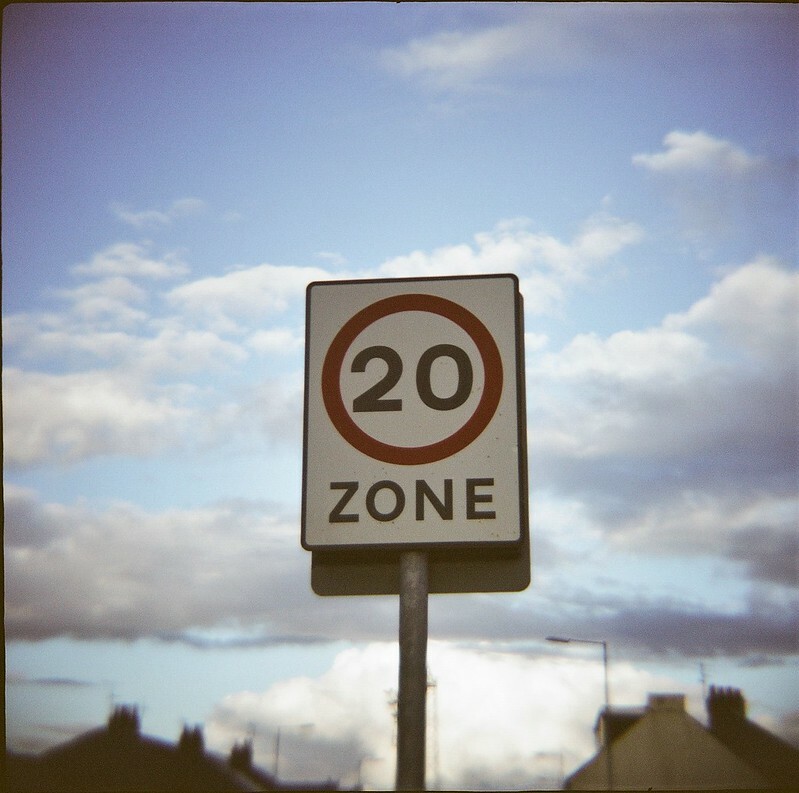 You’ll need to factor in film speed and average conditions when shooting. However I was able to shoot some film rated at effective 25 ISO on it. Whilst we’re on film…. 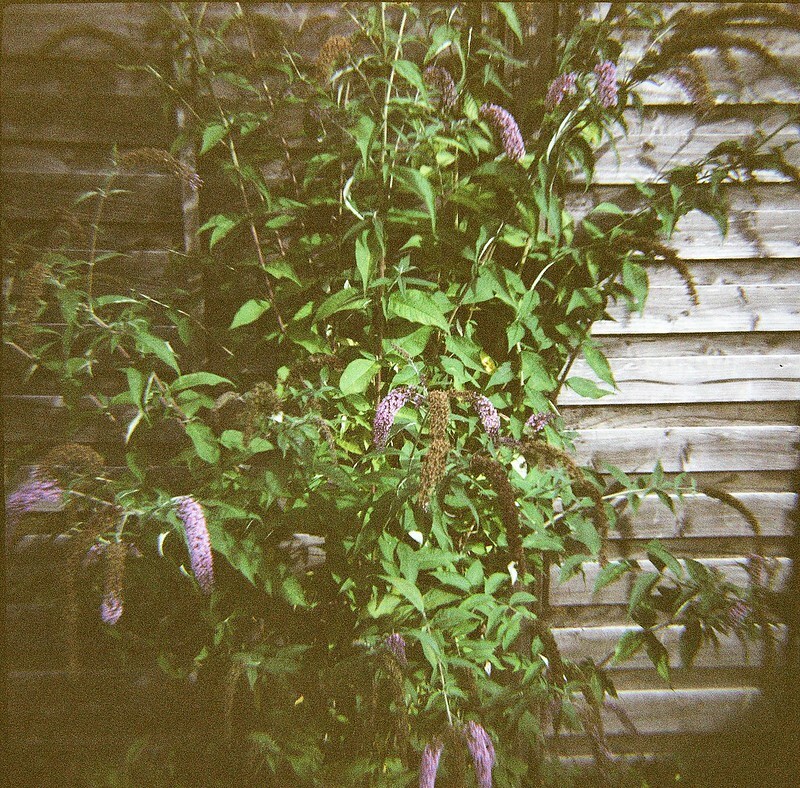 There was some serious issues with Lomography film ironically as I’ve already blogged about. Worth noting I preemtively taped up the body. They’re notorious for light leaks. If you were expecting crisp , accurately exposed images, you’ve come into the wrong saloon partner ! That said if Lo-Fi is your thing, there’s a lot to like here. 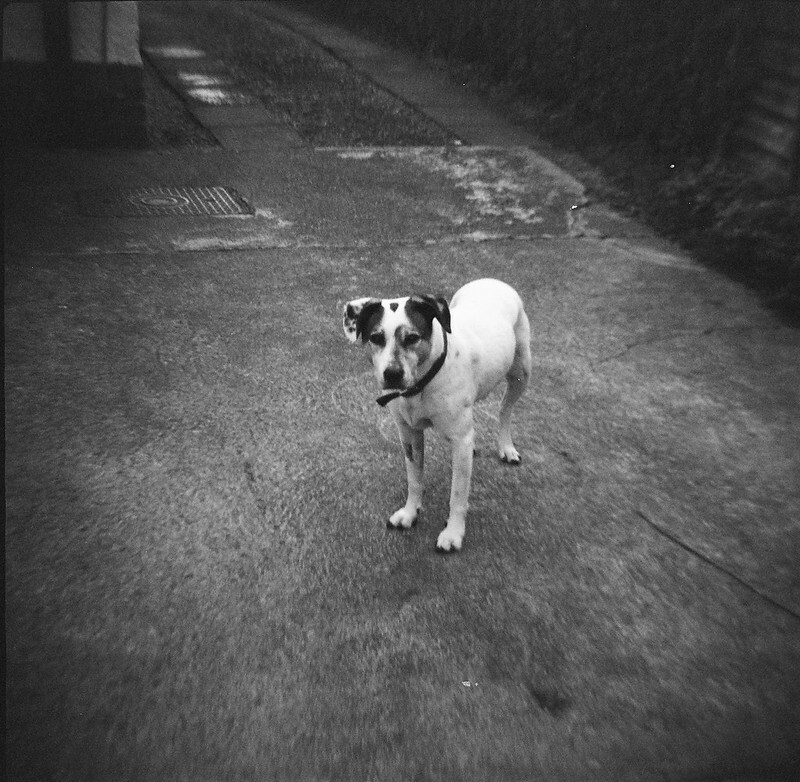 Actually I do believe this is just that bit better than the Diana F+. The images are very similar though. Sharper in the centre with softness creeping in at the edges in a circular fashion. It vignettes even at the wide end of things (most of the 23 year expired Reala had to be shot wide). Even at its best it aint sharp as tack, but that’s not the point. There’s some pincushion distortion evident, chromatic aberrations and there is a bit of colour shift. The lens truly adds something unique to the shots that’s hard to quantify. To some its lo-fi rubbish but to me there really is something quite magical. Lomography deserve credit with the F+ as it almost matches this. But the Original just seems that bit better at it. I’m not going to attempt a L5S price here as things are too complex. These pop up not infrequently on eBay but not in that great numbers. In addition various clones seem to sell for more or less. I couldn’t get enough Original Diana to give an idea for a L5S. What they do seem to sell for is usually in the £10-20 mark +P&P. Light leaks are notorious, although that might be your bag. Otherwise by some cheap black electrical tape. This isn’t the first one I’ve had – it worth checking the shutter still opens. I really enjoyed this once I actually got it loaded. It is simple fun and seat of your pants stuff. I probably enjoyed it more as I’ve shot a load of hi-tech automated stuff recently. It is a Lo-Fi classic and marginally better than the F+ in the results IMHO. That said you do trade off the features you get with a system camera like the F+.